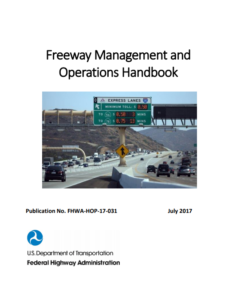 As the TRB Freeway Ops Committe states, “The Freeway Management and Operations Handbook (FMOH) provides an overview of the institutional and technical issues associated with the operation of a freeway network. The FMOH provides an overview of the potential strategies, tools, and technologies that may be used to support the management and operation or be considered in the planning or design of a freeway network. A new version of the handbook was completed in 2017, and is a major revision, bringing every chapter up to date while and adding new information on subjects such as connected and automated vehicles. Unfortunately, formal publishing by the FHWA has been delayed. The complete final handbook is available for free reading and/or download on the TRB Freeway Ops Committee website. Disclaimer: While at Noblis, I served as the project manager for this update and authored some of the chapters.